It’s quite clear that not only has Kristol not learned the lessons of Iraq but also is willing to rewrite the history in such a way to exonerate the Bush administration from its failings. When President Obama took office, Iraq was calm, al-Qaeda was weakened and ISIS did not exist. Iran, meanwhile, was under pressure from abroad (due to sanctions) and at home (due to popular discontent, manifested by the Green uprising in the summer of 2009). The Obama administration threw it all away. It failed to support the dissidents in Iran in 2009, mishandled the Iraqi elections in 2010, removed all U.S. troops from Iraq at the end of 2011, and allowed the Syrian civil war to spiral out of control from 2011 on. Oh yeah I forgot, things were going great in Iraq until Barack Hussein Obama took office. If only the U.S. got more involved in the Iraqi elections (whatever that means) and “supported” dissidents in Iran (whatever that means) and kept U.S. troops in a bit longer (say another 100 years or so?) why today we might well be witnessing Jeffersonian democracy or a Madisonian republic in the Middle East! And the whole bit about WMD not being found in Iraq? Details. Who cares! Nearly 4,500 Americans died, tens of thousands more were wounded, and $2 trillion was squandered in a war to destroy weapons of mass destruction that were never found. 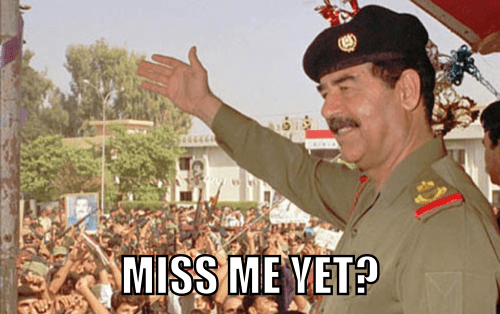 And though the war disposed of a bloody dictator, Saddam Hussein, it ushered in something worse, at least for the United States: A sectarian civil war that killed hundreds of thousands of Iraqis and gave birth to Islamist terrorism, now under the banner of the Islamic State. The more legitimate Afghanistan War was orphaned, turning it into a quagmire, and allies were alienated. Today, Iraq is splintered and reeling. With the capture this week of the key Sunni city of Ramadi, ISIL is firmly in control of one chunk, and Iran — the war’s big winner — has great sway over another. Obama’s policies have indeed made things worse. But in arguing that he should have kept troops in Iraq longer, his critics skip over the inconvenient fact that he pulled out on a schedule negotiated by Bush. And, of course, had Bush not launched the war in the first place, there would have been no such mistakes to make. There’s just no getting around those fundamental facts. The Neocon experiments have failed. But what can you do? Neocons are gonna Neocon. Operation Inherent Resolve is the new name for the 2014 U.S.-led intervention against the Islamic State of Iraq and the Levant. From military aid, advisors and humanitarian efforts, the operation has evolved into airstrikes in Iraq and Syria. The U.S. also has troops on the ground, to serve as “military advisers,” to protect key infrastructure and U.S. installations, and to coordinate humanitarian interventions. Though the “resolve” is allegedly “inherent,” President Obama maintains these troops will not engage in combat. What is not inherently apparent is whether the operation is constitutional, how its goals will be achieved, or how things are going thus far. Congress has not declared war. Air strikes commenced on August 8, 2014. The Commander-in-Chief’s sixty-day grace period under the War Powers Resolution—itself of questionable constitutionality—thus expired in early October. Or maybe Congress has authorized the operation. The White House claims that the 2001 Authorization to Use Military Force and/or the 2002 AUMF provide sufficient Congressional approval. The former authorized the use of force against anyone who aided in the September 11, 2001, attacks (whoever or wherever they might be). The latter authorized force against “Iraq” (whatever that is). One can have some fun—and score some purely political points—arguing that, if the same authorization applies, then those “wars” were not successfully completed. Or if they were successfully completed, and this is a new and different conflict, then POTUS needs to go back to Congress. It is now mid-October. Has the strategy been any more clearly defined? While the U.S.’s involvement “is going to be a long term project,” the President nevertheless concedes that “[t]here is no American military solution to the larger crisis in Iraq.” Instead, the U.S. encourages the formation of an inclusive Iraqi government, which would in turn make Iraqi forces stronger and more cohesive in their efforts to defend themselves. We already did that once, didn’t we? This effort will be complicated by the fact that, as the Times reported back in July, classified assessments of the Iraqi military find it to be “compromised” by extremists, making it too dangerous for US troops to work with them against ISIL. That complication illustrates one of the overarching problems with the “war” on “terror” from the outset: We cannot tell who the enemy is and we cannot know when it has surrendered. How do we tell which people in Iraq and Syria are ISIL and which are ISIL’s victims? What would the “defeat” of ISIS look like? How do we know when it has happened? Does everyone who supports ISIL have to be dead? Do its leaders sign surrender documents? Until we define the answers to these questions, our actions against ISIL will either be ineffective or never-ending—or both. If it remains unclear exactly how the US will know when it has defeated ISIL or how long that might take, it is even murkier how it is going so far. With $2 billion in assets and substantial support from Sunni Muslims around the world, ISIL’s ranks are swelling and it is drawing recruits from foreign countries everywhere. As ISIL continues to behead captives in retaliation for western interference in its endeavors, the fault lines of shifting alliances are as treacherous as ever. In Syria, ISIL is fighting President Bashar al-Asad, who the U.S. agrees “must go.” The U.S. is trying to help Syrian “moderates” fight against both Present Bashar al-Assad and ISIL and other “non-moderate” rebels. After Susan Rice claimed Turkey had agreed to let coalition forces use Turkish bases to assist the moderate Syrians rebels, Turkey repudiated any such agreement. Instead of helping in the fight against ISIL, Turkey has bombed a faction of Kurds called the PKK. The PKK is designated as a terrorist organization by both Turkey and the U.S. But the PKK—along with other Kurds—is currently trying to defeat ISIL militants near Kobani, which the U.S. (and presumably Turkey) also wants to do. U.S. ally Saudi Arabia officially condemns and opposes ISIL. It is one of the coalition members. But Saudi Arabia supports Sunni Salafism, which is the philosophy also followed by ISIL. The U.S. and Iran do not get along, because the U.S. considers Iran a terrorist state and opposes its efforts to develop nuclear weapons. But Iran is helping support the Iraqi government against ISIL. In exchange, it wants concessions on its nuclear aspirations and a reprieve of sanctions. Fighting ISIL would help the U.S. and moderate Iraqis. It would also help Iran’s friend, Bashar al-Assad, who the U.S. says “must go.” At the same time in Yemen, Iran is supporting the Houthis, who are moderate Shiites and thus enemies of ISIL. This will anger U.S. ally Saudi Arabia, who is helping in the fight against ISIL in Iraq but who also supports Sunni Salifism, which is the philosophy of ISIL. So some of our friends support our enemies and some of our enemies are our friends, and some of our enemies are fighting against our other enemies, whom we want to lose, but we don’t want our enemies who are fighting our enemies to win. [And i]f the people we want to defeat are defeated, they might be replaced by people we like even less. North Korea is the most mysterious of all the teams to compete in the 2010 World Cup. As in soccer, so it is in geopolitics. Before the tournament started, no one outside North Korea knew what to expect of the team. There is little reliable intelligence on what goes on inside the country whether it’s soccer or anything else. The secretive communist state keeps its doors closed tight and maintains total control of news media. Paid actors, not real North Korean fans, have made up the team’s audience in South Africa. The one reliable way to gauge the North is to expect the unexpected: last time the DPRK participated in the World Cup — in 1966 — it surprised everyone by blasting through to the quarterfinals. The first match in 2010, against Brazil, exemplified North Korea’s geopolitical strategy and tactics. Few would have guessed that North Korea was capable of competing with Brazil, the team that has won the most World Cup championships. But for decades the same combination of uncompromising loyalty to the group and the element of surprise have enabled Pyongyang to maintain power despite being surrounded by the likes of greater powers — the United States, Russia, Japan, China and South Korea. This is not to exaggerate North Korea’s strengths — its economy is a shambles, and despite its military’s size, its capabilities are limited. Fear of defeat by foreign competition is why the North rarely ventures abroad, earning the nickname the “Hermit Kingdom.” Pyongyang knows that public humiliation could weaken the group morale that is essential for the regime to survive. But as with its array of missile tests, it is at least able to use the team’s participation on the global stage as domestic propaganda. North Korea’s presence in an international sporting event like the World Cup sounds very analogous to the emphasis by Saddam Hussein and his sons on the Iraqi Olympic Soccer Team, who were famously tortured by Uday Hussein when they failed to meet expectations, and the Soviet Olympic Teams, which utilized the Olympic Games as another means to try to best the west. Even if you’re not a fan of the sport, the political proxy nature of the World Cup should be fascinating enough to illicit at least nominal interest in the event.